Bringing a new kitten into your home is a very exciting time. Just imagine all the fun you can look forward to in the years ahead. A kitten is a great pet and a wonderful source of endless companionship and entertainment for their owners. Every kitten has a unique personality; some are shy while others are confident. Whatever their character, this is potentially a traumatic transition for kittens as they leave their mothers and siblings for the first time to go to a new home. Here are 8 tips for making your new kitten’s transition a little easier. When feeding your kitten, you need to supply them with all of the body building nutrients they require to grow and develop. Just as babies need food that’s designed to give them a healthy start in life, kittens need the right balance of vitamins and nutrients for them to thrive. The best food for kittens in their first four weeks is their own mother’s milk. This provides all the required nutrients they need and passes on vital antibodies to protect them against various diseases. By 8 weeks, kittens should be completely weaned from their mothers and it becomes your job to provide a complete and balanced diet for them. Kittens should be fed a combination of high quality kitten food and natural foods. Natural foods include humane-grade raw meat such as diced up raw lamb and pieces of raw chicken meat. It is important that all raw food offered to kittens should be fresh. Kittens aged between 6 and 12 weeks need to be fed 4 or more small meals a day. At 12 weeks they should be fed 3 times a day and by the time they reach 6 months they can then have twice daily feeding. By 12 months, kittens are ready for cat food. In addition to their diet you can also introduce Transfer Factor Classic into their food. The capsules can be easily opened and mixed into their favourite food. Always ensure that your kitten has an adequate supply of fresh and clean water at all times. Although your kitten may want to share your bed with you it is important to provide them with a warm, dry bed of their own. There are many different cat beds available in all forms and sizes and in a huge range of prices. You don’t have to spend a lot of money as your kitten will be perfectly happy in a cardboard box lined with a blanket, baby quilt or lamb’s wool cover. The important thing is that they have a warm place to sleep and cuddle up in. If the weather is really cold put a hot water bottle under their blanket. Try to make your kitten’s bed snug. Kittens love to curl up in snug areas and can sleep between 15 to 18 hours a day! When you first bring your kitten home, they may miss their mother and siblings. Your kitten may meow in confusion or wake up during the night. Ease their stress by picking them up, stroking him/her while speaking in a soothing tone. You can also wrap a ticking clock in a towel and place it near their bed to remind them of their mother’s heartbeat. Your kitten needs to learn the house rules from day one – for example, that climbing the curtains, sharpening their claws on the sofa, stealing food and frightening the budgie, are not acceptable behaviour. If they get into mischief, a sharp ‘No’, or a clap of the hands should be enough to distract them. Never smack a kitten as they won’t understand. Once you have made a rule be consistent and ensure that all of the family follows the same rules, to avoid confusing your kitten. You will never stop a kitten from scratching but you can divert their claws from your sofa, furnishings or carpet to something more appropriate like a scratching post. If you are handy you can make your own scratching post. 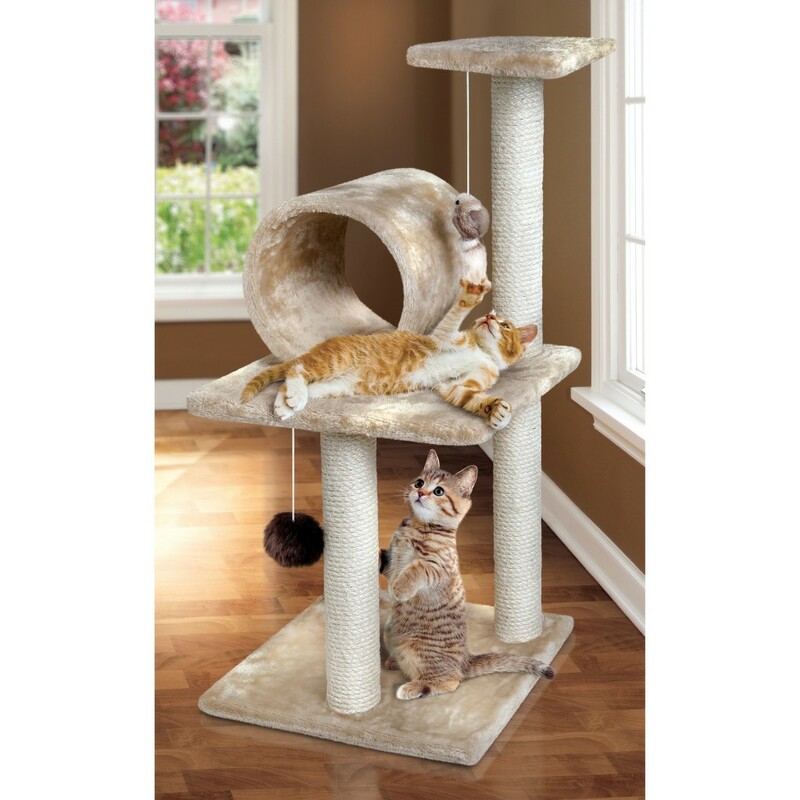 If not, there are many scratching posts available that can be purchased in a price range from $10.00 up to over $500.00. Once you have a scratching post in your home, place their paws onto the post and simulate scratching. Praise them and say ‘Good Kitty’ and stroke them to make it an enjoyable experience. Over the coming weeks reinforce this acceptable behaviour with praise whenever they use the scratching post. Never punish them for scratching inappropriately but praise them well when they do the right thing. It’s all about rewards and pleasant experiences. Kittens can also get tangled or choke on anything swinging or hanging. Therefore, keep your new kitten safe by securely anchoring drape or blind cords out of reach. To prevent chewing on electric and phone cords, bundle them with a cord manager and fasten away from kittens’ reach. Rubber bands, jewellery, Christmas decorations, balloons and other small items are dangerous to kittens that may swallow them. Remove poisonous plants, and roach or ant traps and make sure the toilet lid is down. Keep kitchen and bathroom cabinets closed so your kitten doesn’t encounter bleach, detergent, dental floss and other household items when exploring. It is a good idea to accustom your kitten to being groomed from an early age. Longhaired cats should be groomed daily while shorthaired cats only need grooming once or twice a week. If you start early enough, kittens love being groomed. Most will even learn to come running when they see the brush in your hand! Grooming is good for your kitten as it removes dust, dead skin, excess loose hairs, grass seeds, tangles and reduces the amount of fur shed during the moulting season in autumn and spring. Grooming isn’t just about making kittens look good – it helps to keep their coats and skin healthy and offers you an opportunity to develop a bond. Always be gentle and make grooming a rewarding and pleasant experience. Teaching your kitten to use a litter tray is not difficult. Cats are instinctively clean and fastidious and toilet training your kitten is relatively simple. The basic requirements are a litter box, some kitty litter and a little time and patience. Keep the litter box in a corner or secluded area of your home. Place your kitten gently into the litter box when he/she is most likely to use it, for example, after meals, long naps, first thing in the morning and last thing at night. Do not allow your kitten freedom of the house until you are certain he/she is using the litter tray regularly. It’s also important to keep the litter tray clean. Many cats will not use soiled litter. A sieve or scoop designed for cleaning cat litter is available at all pet supply stores and departments. Active healthy kittens rarely need their nails cut as they file them outdoors during activities, like climbing trees. However, indoor cats will need to have their nails clipped regularly. Check your cat’s nails, especially the back paws, once a week. If their nails are showing when the cat is resting and they are retracted – they will need trimming. Ask your vet or groomer to show you how to trim nails properly if you are unsure. Never cut them too short! When you check their nails, also check the paw pads for any cuts or foreign bodies and check between their toes for any signs of soreness. It is important that your kitten can be identified if they become lost or injured away from home. A microchip is a tiny electronic device – the size of a grain of rice – that is injected under the loose skin at the back of the kitten’s neck. The microchip number is recorded on a National Pet Register with details about the kitten and the owner. Should your pet stray or become lost, vets, animal shelters and local councils can scan your pet for a microchip and contact you via the database. Another form of identification for your kitten is putting a collar on them which contains your contact details if they become lost. Collars can be introduced to kittens at 6 months of age and older. Put the collar on them on a Friday night and keep a close eye on them over the weekend. You can expect your kitten to be a bit freaked out and annoyed initially but that is normal. No matter what type of collar you choose for your kitten, a proper fit is crucial. You should be able to fit two fingers between your kitten’s neck and the collar. Make sure his/her ID tag or information is on the collar. You may decide to introduce the collar first, and after your kitten gets accustomed to the collar, then add the tags. But don’t forget to add the tag or have ID information sewn into the collar itself. Kittens have so much energy; they need to stay active to be happy. If you bring home two kittens together rather than one, they’ll focus on play-fighting, scratching and wrestling with each other, and are less likely to feel lonely. They are also a lot more fun to watch.